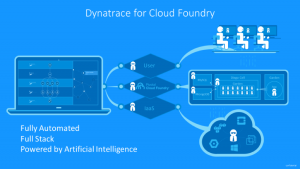 We’re happy to announce that Dynatrace has once again broadened its support for Cloud Foundry technology-specific buildpacks. We already support buildpacks for Java, PHP and Staticfile applications, and applications that run on IBM WebSphere Liberty. 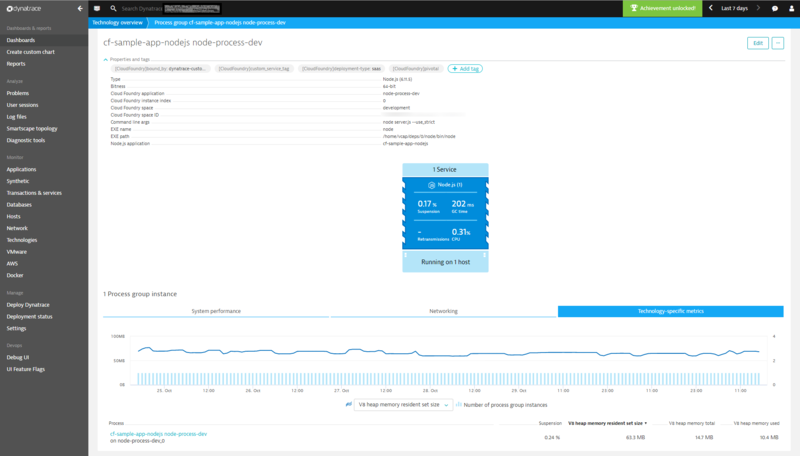 As of today, Dynatrace also supports Cloud Foundry’s Node.js buildpack for monitoring Node.js applications that are deployed in Cloud Foundry PaaS environments. You no longer need to install a dependency on @dynatrace/oneagent in your project directory. cf cups dynatrace-service -p "environmentid, apitoken, skiperrors"
You’re prompted automatically to provide your environment ID, API token, and either true or false for the skiperrors flag. Please note, by default, an unsuccessful download of Dynatrace OneAgent will result in a deployment error. With the buildpack approach you no longer rely on releases of the Dynatrace OneAgent dependencies for NPM. The buildpack automatically fetches the latest version of Dynatrace OneAgent. If you’ve specified a default OneAgent install version for new hosts and applications in your OneAgent updates settings, the buildpack will download the defined default version of Dynatrace OneAgent. Potential fixes can now also be rolled out faster and more easily than they could previously. Further, you can also remove the require statement mentioned above from your application. To set up Cloud Foundry monitoring and start using the Dynatrace integration into the Node.js buildpack you first need to link your Dynatrace account with your Cloud Foundry applications. To do this, you need to create a Dynatrace service in your Cloud Foundry environment and bind it to your Node.js application. For complete details, please see the Cloud Foundry installation guidelines. We’d love to hear from you. Tell us what you think about the new Dynatrace integration into the Node.js buildpack. 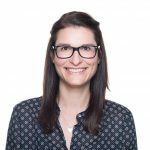 Please share your feedback at Dynatrace Answers. Note: Dynatrace OneAgent for Cloud Foundry PaaS is integrated with release v1.6.10 of Cloud Foundry’s Node.js buildpack and requires OneAgent version 1.131 or higher. Earlier OneAgent versions < 1.131 still require the Dynatrace NPM module for PaaS together with an earlier Node.js buildpack release < v1.6.10.